After years of parents and guidance counselors pushing young people toward universities, the nation is experiencing a shift in values. Trade school has taken the spotlight from 4-year colleges as the path to a good career. Whereas 10 years ago honors students set their sights on Ivy League schools, today many of these bright, young men and women are choosing technical programs instead. Why? Rising college tuition costs, astronomical levels of student debt, high drop-out rates and poor career outcomes have all contributed to a decline in the value of a university education. More than 30 percent of grads are working jobs that don’t even require a four-year degree. At the same time, the nation faces a widening skills gap. Positions in the trades like welding and HVAC are difficult to fill, making vocational training all the more valuable. But is trade school worthwhile for you? That depends on your resources, preferences and goals. When it comes to a post-secondary education, one size does not fit all. There are several factors to take into account when weighing your options. Do you learn better in a traditional classroom setting or by putting instruction to work in a practical way? If you learn best by doing, then trade school could a good fit for you. Students spend most of their time in labs receiving hands-on training from industry pros. Since the ratio of students to instructors is often lower, it can be easier for them to get one-on-one assistance with projects. What do you want to learn in a post-secondary program? 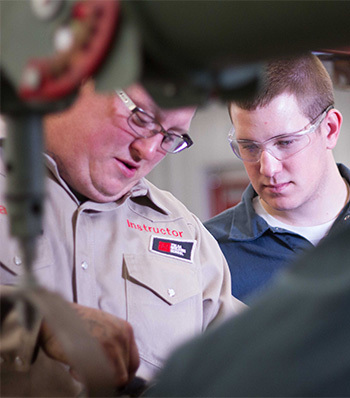 Trade schools offer a more singular focus, such as welding. Learning all about the properties of metal and how to join it is great if you want to become a welder. But if you’re not sure what you want to do when you graduate, it might be best to experiment with a variety of subjects at a community college first. If you want to become a doctor or lawyer, several years of college and internships will be necessary. How soon do you want to enter the job market? To ask the question another way, how long can you afford to devote to not earning money or making part-time wages while you learn? Trade school can be a great choice if you don’t have the time, money or desire to spend several years at a university. A welding program, for example, can be completed in as little as 7 months. Vocational training programs typically span from a few months to 2 years. Earning an associate degree at a community college usually requires at least 2 years of study, but many students take 6 years or more. Those who want a bachelor’s degree can expect to spend at least 4 years in school. The shorter training time of trade school can be an advantage for career changers and working parents. Many technical schools also offer flexible scheduling with day and evening classes. How much can you afford to spend on a post-secondary education? College is more expensive than ever. Over the last 10 years, the in-state fees and tuition for 4-year colleges has jumped at an average rate of more than 3 percent above inflation each year, and that’s just for public schools. As a result, the average student graduates with nearly $40,000 in debt. Just how much could a bachelor’s degree run you? In the U.S., the average cost is $127,000. Trade school, on the other hand, is about $3,000 to $15,000 a year. And what about community college? Including housing, books and transportation, approximately $14,000 a year. How much can you expect to make with a vocational certificate? More than you might think. Times are changing, and the gap between the earning potential of a technical certificate and a bachelor’s degree has been growing smaller and smaller. This is in part due to the skilled trades shortage. Demand for qualified tradespeople has been rising while, thanks to retiring baby boomers, the supply of trained workers has been shrinking. And the trend of steering young people into universities over the last several decades is part of the problem, too. Not enough men and women receive technical training to replace the mass exodus of older tradespeople. New economic research suggests that trade schools may provide better outcomes for U.S. workers than 4-year colleges. Economics researchers at the University of Southern California and New Zealand’s Victoria University of Wellington found that improving vocational training opportunities in relation to the size of the United States’ manufacturing industry could lower income inequality, resulting in greater prosperity for earners below the highest 10 percent of household incomes. “Chances are that better vocational education access and its quality in the U.S. would increase the income of the workers that are in manufacturing, and probably would reduce the overall income inequality in the US,” explained USC economics researcher Joshua Aizenman. Now the you know some of the important factors to consider when choosing a post-secondary educational path, you can get a better of idea of what the return on your investment could be. A great way to really understand which type of education will have the best payoff for you is to compare the cost of the trade school program you’re thinking about enrolling in to what you could potentially earn. You can check the Bureau of Labor Statistics for average national salaries for the various occupations. Make sure to add other qualitative factors to your returns, such as how trade school aligns with your learning preferences and schedule. Even more importantly, think about how fulfilling you might find a career in trades, like fusing metal or wiring buildings.